It’s so important to protect skin from the sun. As unfamiliar as it is for us Brits to slather ourselves with an SPF even when the sun is tucked behind the clouds, skincare brands are making sure that we’re learning to embrace year-round sun protection by adding SPF formulations to day creams, foundations and concealers. There are so many choices out there now that sometimes it can get a little confusing. Adequate sun protection doesn’t have to be hard work, and it doesn’t have to involve heavy, thick and uncomfortable formulations. HissyFit was created to take the stress out of looking after your skin, condensing whole regimes into one easy and effective step. 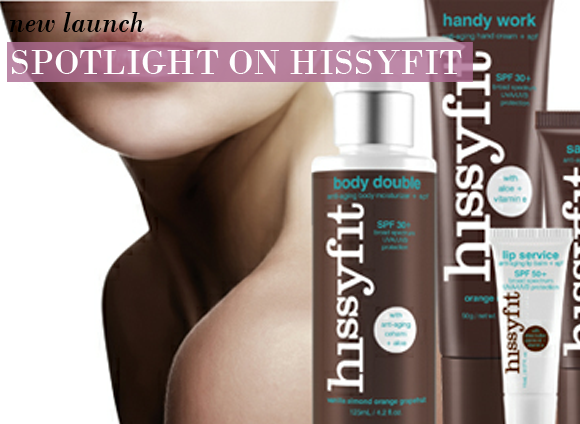 As HissyFit themselves say, they’re 3-in-1 products that you’ll actually want to wear every day. So whether you’re braving the British weather, jetting off to sunnier climes, or taking on the pistes, make sure that you’re protected all year round. HissyFit’s star product is its Saving Face foundation, £18.80: an innovative SPF50+ formulation for maximum protection with minimum fuss. Its smooth and creamy formulation is enriched with moisturising daisy extracts, alongside natural anti-oxidants pomegranate and green tea. Even the SPF formulation is completely natural, offering broad spectrum UVA/UVB protection whilst respecting the skin’s delicate balance. Saving Face offers the complete coverage of a foundation without suffocating the skin, and is blendable and buildable, creating a flawless canvas. Sun protection for the body isn’t necessarily something that you’d give much thought to. But if it smelled, felt and made you feel amazing, then you’d probably use it as often as you’d use your usual body lotion. This is the idea behind Body Double body moisturiser, £21.36, a luxurious body moisturiser that with a broad spectrum SPF of 30+. It continually cares for the body, protecting it from sun damage and free radicals, whilst offering long-lasting hydration from soothing aloe vera. With a delicious aroma of vanilla, almond, orange and grapefruit, you can even forgo wearing perfume! Aside from your face, your hands are the first place affected by sun damage and aging. Think about it – your hands are constantly exposed to the elements, with environmental aggressors and free radicals a daily concern. Nourishing hand protector Handy Work hand cream, £16.24is a luxurious cream that hydrates and shields skin from the sun’s rays all day long. Its broad spectrum SPF of 30+ prevents the thinning, hyperpigmentation and discolouration that can occur from sun exposure, whilst botanical extracts soothe and smooth the skin beautifully. Just as facial skin ages, so too does the skin on and around your mouth. Lip Service lip moisturiser, £10.25, a fabulously nourishing lip balm, smooths fine lines and wrinkles, deeply hydrates the skin and protects lips from sun damage with an SPF of 50+. Added shea butter, jojoba oil and vitamin E ensure a soothing protection that can’t be beat, whilst its range of tints from bubblegum pink Guava to chocolatey Toffee will make sure you’re not missing out on your colour fix. Discover more about the range here, HissyFit. This entry was posted on Wednesday, November 3rd, 2010 at 8:30 am and is filed under Brand Focus, Make-up, Skincare. You can follow any responses to this entry through the RSS 2.0 feed. You can skip to the end and leave a response. Pinging is currently not allowed.